Save 10-15% on your order today and accept delivery in 4-6 business days! Just select the Green "ADD TO CART" Button now! 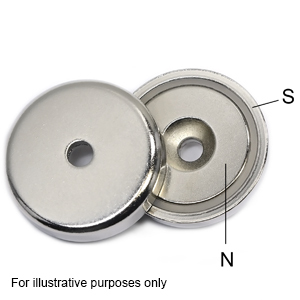 This round base cup magnet consists of a grade 8 ceramic magnet, one of the strongest ceramic magnet grades available. This super strong magnet is seated in a chrome plated steel cup that completes a magnetic circuit so that the holding force is triple that of an identical magnet outside of a steel cap. The steel cup also provides protection to the magnet, making it more durable. Some data may be approximated. This high strength cup magnet is made of a ceramic c-8 magnet encased inside a chrome plated steel cup. This design greatly increases the holding power of the magnet, as well as protects the magnet from shattering or damage from everyday use, allowing it to last much longer than a plain magnet. This magnet holds up to 88 lbs when held against steel surfaces when the magnet has direct contact with a smooth plain steel surface. The countersunk hole is meant for a #10 flat head screw to ensure a flush fit with the cup magnet. This magnet measures 1.26” in diameter and is .27” thick. Ceramic cup magnets have a multitude of uses beyond sticking items to your fridge because of their immense strength and small size, and their countersunk hole lets you mount these magnets anywhere for an endless amount of uses. 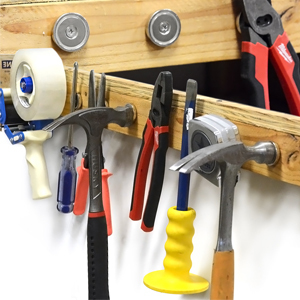 Uses for this magnet range from magnetic fishing, to storing tools and high capacity holding. ceramic cup magnets aren’t your typical neodymium magnet because of the way that they manipulate the existing magnetic field to increase their strength. As strong as neodymium magnets are, they only use one side of their magnetic field to stick to metal which means they’re only using half of their available strength. 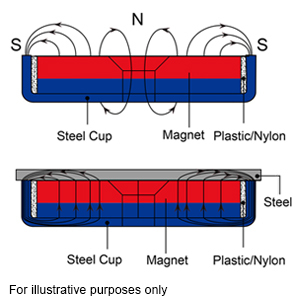 The addition of a steel cup however, allows the other pole of the magnet to be used which increases the strength of the magnet to much higher than that of a normal neodymium magnet but also makes the other side magnetically weak. 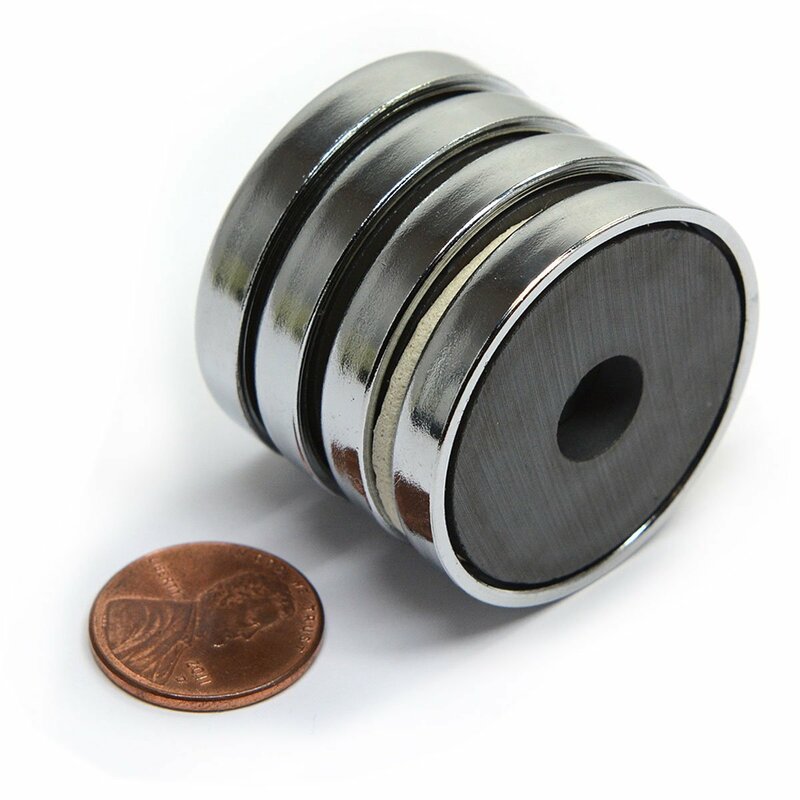 If the highest possible pull force is required, then neodymium cup magnets are the answer to your magnet needs.